Whoo hoo. I finally made something for my gf, Mary Ellen or better known at M.E. No not *me*. M.... E.... said like Emmy. Who's on first? Anyway, I'm giddy because it's done and happy that I even got outside on a nice day to take the picture of it. I must admit though it feels a little odd standing outside on an 80 degree day wearing a hat, scarf, mittens, hoodie and shorts. Ahh. Feels great to have it done and I think it looks pretty darn good too. Would you believe that I must have started that darn scarf at least 3 times trying to wrap my brain around it. Then it dawned on me that I really needed to follow the of keeping the multiples the same and (doh) cast on the right number. Ah, the act of frogging sure builds patience and knowledge. What's the next project? Yikes... knitting wise I have 4 unfinished projects right now. The dishcloth for Jeannie which I need to "embroider", that crochet jacket, Dave's clogs and the dragon scarf. Plus I'm kinda thinking it would be fun to include a doggie jacket for M.E. 's terrier Buddy since the Road Scarf is basically a gift to keep her warm while walking the dog and talking to me on the phone. There's also a gob of ivy growing and I'm just dying to try making my own ivy wreaths. I modified it a little bit because I didn't want it quite so wide. 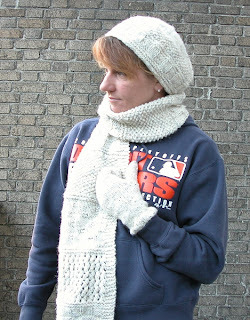 I got to use several new patterns making this scarf too. Heck any patterns can be used so long as they are all divisible by the same number then just add 8 to the cast on for the seed stitch edging.